We are pleased to offer the following vacation packages for the Kentucky Bourbon & Bluegrass Country. For more information and/or reservations, please call our toll free reservation line at 1-800-352-3992. Come help us celebrate 100-years with our Century Celebration Package. Enjoy a two-night mid-week stay (Sunday-Thursday nights), with 10% off our seasonal lodging rate, a $25 food voucher for use during your stay in any of our three restaurants, and a 15% discount in our Gift Shop (as our gift to you!). Please note this package requires a two-night minimum/double occupancy only, is not available on Memorial Day, Labor Day, or Thanksgiving Day (other blackout dates may apply), is not applicable with any other discount, and cannot overlap with a Saturday night on the front-end of your stay or a Friday night on the back-end of your stay. Stay at the Inn and enjoy our A Night at the Theater Package, which includes 50% off appetizers and one round of before theater drinks and free dessert. $50 in addition to your room rate. Our lowest rates of the week are Sunday nights! While our restaurants are closed for Sunday dinner, we’ll direct you to nearby choices. From $115 (includes breakfast). Pick a room. Add a delicious local sampler to your stay! Includes 2 Three-Selection Bourbon Flight Vouchers in any of our dining facilities, Rebecca Ruth Kentucky Bourbon Candies, a plate of Kentucky cheeses, and a full Southern breakfast in the morning. $50 in addition to your room rate. You round up your girlfriends, and we’ll build the package around what you want to do. On your first night with us, we’ll reserve the side room of the Owl’s Nest for you and up to 9 of your friends. The first cocktail or glass of wine is included in the package price in addition to a few appetizers on us. Have drinks and retire to the Parlors or the James Harrod Room to tell old stories and reminisce. The next day is when we need some direction. Would you like a day of spa treatments at the Bell Cottage Spa? Yoga on the lawn? A trip with Central Kentucky Tours to visit Horse Farms, Wineries or Bourbon Distilleries? You tell us what you want to do and we’ll see what we can arrange. Dinner in the Main Dining Room that evening from Chef Brian’s menu or would you like a private, multi-course wine-paired dinner for you and your friends. We’ll need a least a week notice. Tell us when you’re coming and we’ll contact Bruce at Central Kentucky Tours to see what he’s offering while you’re with us. We’ll get you scheduled for whichever exciting tour Bruce has available, whether it be one of the great Horse Farm Tours or the circuit he makes on the Kentucky Bourbon Trail. Arrive back at the inn and pick up your pair of 4-Sample Flight Cards to pick and choose your way through our fine selection of Kentucky Bourbon. Includes Bourbon Gift Basket made up of Distillery swag to take home with you. Does not include Lunch on tour, taxes or gratuities. $280 in addition to your room rate. One dozen red roses, a bottle of Veuve Clicquot, and a dozen chocolate covered strawberries will await your arrival in your room for you to enjoy before your romantic dinner in the Main Dining Room that evening. Alcoholic beverages at dinner are extra. $295 in addition to your room rate. 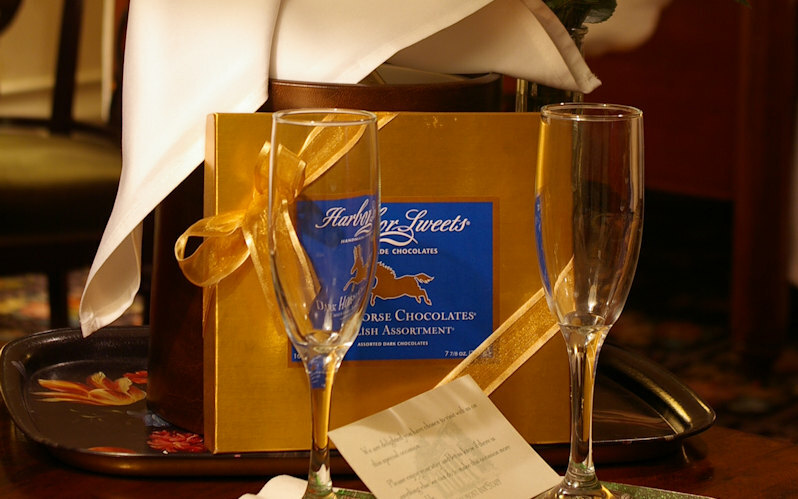 A half-dozen red roses, a bottle of our house sparkling wine, and 6 chocolate covered strawberries await you on your arrival in your room. $95 in addition to your room rate. There is so much to do in our area that you must stay at least three nights: bourbon distilleries, Shaker Village, shopping, golf, historic sites, etc. And don’t forget the great food at our three restaurants and pampering at our spa! For 3 or 4 nights, get 10% off your room rate. (15% or 5-7, 20% on 8-10). Discount does not apply to packages or other discounted rates. Some date restrictions apply.